Are you having trouble picking a table saw for your workshop? I know it’s a bit overwhelming with so many options out there so I’ve decided to make your choice easier by picking the top 5. There are a few factors to consider when making the decision but in my opinion, the most important one is the size. My goal for this article is to help you choose the most convenient model for your workshop. There are a few models that are a bit more advanced so make sure to read carefully. If you are already an advanced woodworker and want to move to the next level I suggest that you check out my review of hybrid and cabinet table saws. Take a look at the full description of each model to find out why they’re the best for home workshops. Before going ahead with the descriptions, there are some details to consider. One more thing, there are models that require a higher level of experience so make sure to know where your skills stand at. When looking at the power of the motor you should think about the workpieces you are going to be cutting. It’s important to know the thickness of your average workpieces, the higher the amperage the thicker the table saw can cut. There are two types of table saws in this review, bench top or stand-up models. Some workers have bigger workshops than others, which means that they probably have enough space for a stand-up model. This is important if you have a smaller workshop. You can’t always leave it laying around so you need to think about how easy it is to move it from place to place. I recommend a bench top model in this case because it’s much easier to carry and store. This also involves portability, if the model is lightweight then it’s a lot easier to move around. If the model is a stand-up saw then it’s probably a bit heavier but pretty easy to move around and keep it in a corner, depending on the size of your workshop. This relies on your level of experience, if you are an advanced worker then you’re probably looking to spend a bit more to get a higher quality saw. If you are an intermediate or beginner then there are plenty of options that are budget friendly. One important feature to consider is a sturdy fence. It’s usually pretty tight in home workshops which can lead to moving your workpiece by accident, so it’s important to have the fence to avoid any sudden movements. The DW745 by Dewalt works with a 15 amp motor that can reach 3850 RPM. The model has a 20-inch rip capacity which is the largest from the review! 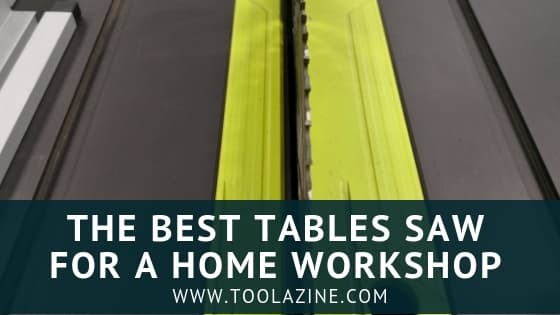 The previous feature allows you to cut bigger pieces, this is quite important for workers with a larger workshop that are in need of a portable and advanced table saw. The base is made from a metal roll cage which is significant for workers that are going to be moving the saw quite a lot. This material makes the model more durable against accidental drops. The saw weighs 45 pounds which makes it easy to move when needed. If your worktable isn’t exactly straight get this: it comes with an adjustable rear foot for leveling the saw in case of uneven surfaces. I give this model 5 stars. You do require a larger budget for this item, so if you’re a professional looking for quality then this is your best option. Go check out the latest reviews and current price of the DW745 here on Amazon for more details. Look at the Owner’s Manual here. The GTS1031 by Bosch is my second recommendation for advanced workers. This model is ran by a 15 amp motor. This saw has a great advantage: it has a balanced one-handed handle. You can carry this model with very little effort when needed. This bench-top model is built from steel and can handle sudden impacts for durability. This model weighs 52 pounds, it is a bit heavier than the previous one but it’s a bit easier to move around due to the well-placed handle. Get this: it comes with a base to make it a stand-up model which is great for bigger workshops. I give this model 4 stars. It’s strong and can withstand any environment. Check out the latest reviews and current price of the GTS1031 here on Amazon for a few more details. The SKIL 3410-02 runs on a 15 amp motor. This model has a cast aluminum table that can be extended for bigger pieces. This is great if you’re considering working with bigger pieces but don’t have the extra space for a larger saw. It also comes with a foldable stand which can be used to your convenience. One last thing, it has a self-aligning rip fence for accurate measurements. This is pretty handy if there’s not enough light in your workshop, this way you can still have accuracy. I give this model 4 stars. It has a strong fence which won’t allow the workpieces to move. Take a look at the current price of the 3410-02 here on Amazon for more information. The Rockwell RK7241S is the best option for small workshops. This portable bench top saw has a built-in handle which makes it extremely easy to carry. It weighs 15 pounds, which is the lightest from the review! It is much smaller than the models in this review but it comes with the essentials. This saw can perform scroll, rip, miter and inside cuts. In most cases, you would need separate machines for each but with this model, you save up money and storage. I rate this model 4 stars. It has great advantages that can be very handy when working in small areas. Go look at the latest reviews and current price of the RK7241S here on Amazon for a few more details. The Craftsman 28461 has a 15 amp motor that has a speed of 5000 RPM. This stand-up model has a cast aluminum table for longer durability. This works great for beginners because it comes with the most important features you could need. If you’re just starting out with table saws this could be a good add-on for your workshop. The model weighs 50 pounds, it is a bit heavy but quite easy to shift to a different place. I give this model 4 stars. I think it’s a good pick for small projects that don’t require too much experience. Check out the current price of the 28461 here on Amazon for a few more details. Comparison of all the models side by side. Please share this on Pinterest. I hope I helped you make this choice easier. Remember to read each detail carefully so you don’t miss anything.